New Website for Gateway Bullets Now Online! Posted by Blue on Dec 9, 2014 in News | Comments Off on New Website for Gateway Bullets Now Online! 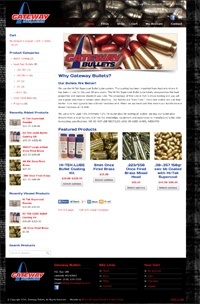 Home » News » New Website for Gateway Bullets Now Online! Local bullet manufacturer, Gateway Bullets, is back online with a shiny new updated design from Blue’s ArtHouse! This website features a WooCommerce shopping cart system.